« GRAND OPENING! 900 Hastings Vancouver Condos for Sale! 283 View Residences from $249,900 at Wall Centre 900 Hastings Wall Financial. Proudly Strathcona! A collection of boutique Sullivan Station Surrey Townhomes is now selling at the Kendra Townhouse project! These handcrafted 3 bedroom townhomes are located in a quiet and safe residential neighbourhood close to community amenities, services, entertainment and transit. Thoughtfully designed to complement the natural surroundings, the Kendra Surrey townhome project will embody contemporary design and elegance as well as give you great value with prices starting from the $320’s. Welcome to a new tradition right here at the new Kendra Surrey Townhomes for sale! The boutique community will feature only 38 elegantly designed family style townhomes that will have Classic Architecture that is both warm and inviting. The South Surrey Kendra townhomes at Sullivan Station will also be located in an ultra desirable neighbourhood that will give you easy access to shopping venues, great restaurants, top ranked schools and beautiful green spaces/parks. The thoughtful exteriors will feature dramatic pitched roofing with striking hardie shingles and siding in addition to picket fences and individual trellis entry gates that create a welcoming and established streetscape. The new South Surrey Kendra townhomes will also be adjacent to a beautiful greenway and creek and the community will have drought tolerant low maintenance landscaping throughout. The homes will have deck and/or garden patios off the main level living rooms overlooking privately fenced yards for a great entertaining and family relaxing space. Also, the well thought out Kenda Townhomes in Surrey Sullivan Station will have secure and spacious garages for two cars side by side or tandem depending on the floor plan. The community itself will also introduce the Kendra Clubhouse which will feature family friendly amenity spaces like a fireside social lounge with kitchen, fitness room and outdoor patio. Quality assurance is by Hayer Properties Ltd. Customer Care and all homes have hard wired smoke and carbon monoxide detectors. There is fully pre-wired in-home security systems and all home purchases have the New Home Warranty by Pacific Home Warranty. To register your interest, please visit their website located at www.liveatkendra.com today. The homes will have prominent individual entry ways that will have class metal doors with windows and polished chrome hardware. In addition, the main floor of these new Kendra Surrey townhomes will feature airy nine foot ceilings depending on plan as well as large wood encased windows that are Low-E and covered with privacy faux wood blinds throughout. The stairways, hallways and bedrooms will have carpeting and the living/dining and kitchens will have plank laminate hardwood floors. The entry foyer will have easy care oversized porcelain tiled flooring and all homes will have cozy electric fireplace with custom mantel in the living room. There’s electric baseboard heating with individually controlled thermostat as well as recessed pot lighting for a truly modern and elegant look. 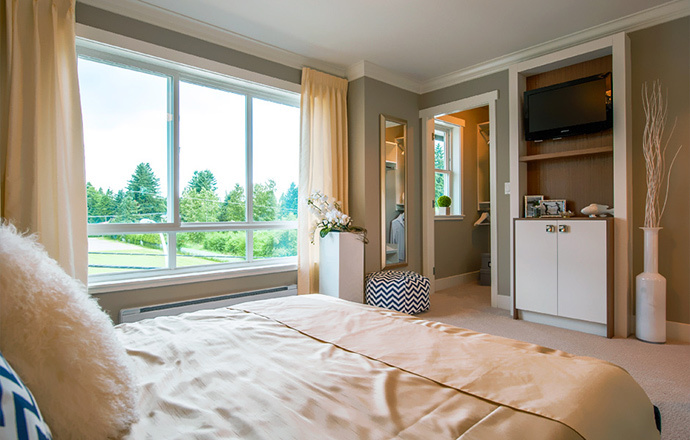 Some of the thoughtful details at Kendra Living in Sullivan Surrey real estate market includes extra storage space designed into your floor plan in addition to built in closet shelves and custom organizers in walk in closets wherever applicable. There is rough-in for a central vacuum system as well as convenient laundry closets with high-efficiency Whirlpool front loading washer and dryer plus linen closet for more storage. The luxury bathrooms at the presale Surrey Kendra townhomes include master ensuites that have oversized showers with frameless glass door and glass tiled accents in addition to spacious quartz counters with vanity mirror, dual flush toilet, porcelain tiled floors. The main baths at Kendra Living will include a soaker tub with ceramic tiled surrounds, quartz counters, dual flush toilet, porcelain tiled flooring and vanity lights. There are polished chrome faucets throughout as well as contemporary shaker style cabinets with chrome pulls and soft close drawers. 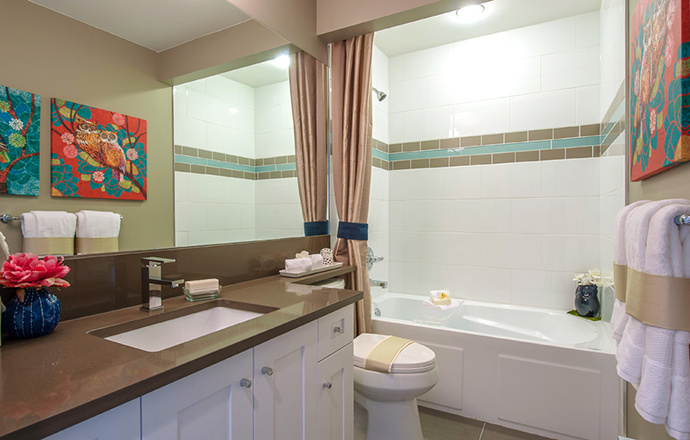 The floor plans also allow for convenient main level powder rooms that are beautifully finished as well. The kitchens at the presale Surrey Kendra Townhomes will feature sleek stainless steel appliance package including a built in island niche for a large Panasonic Microwave with trim kit, ultra quiet and efficient Whirlpool Energy Star dishwasher, under cabinet Broan range hood fan, Whirlpool electric range with ceramic glass cooktop and large oven capacity as well as a Samsung Energy Star counter depth fridge/freezer. 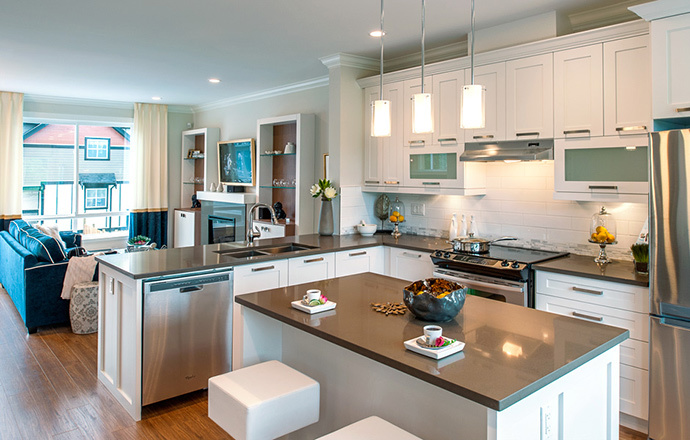 Other kitchen features at Kendra Townhomes in Surrey include a kitchen island and integrated breakfast bar as per plan, custom crafted shaker cabinets with frosted glass doors, under cabinetry valance lighting, brushed modern hardware and soft close drawers. The counters will be solid quartz stone and the backsplash will be elegant ceramic tile work with marble accents. There is an undermount stainless steel double sink, garburator, single lever low flow faucet and pullout vegetable spray with flex line. As well, the kitchens will have convenient full height pantry. Some of the optional upgrade options at the presale Surrey townhomes at Kendra Living include optional closet or full bathroom in the flex room (as per plan), quartz surround for the fireplace mantle, pantry with door in place to Tech Nook in D Series home plans and upgraded fridge with ice maker and water dispenser. Uplift your life by making the Sullivan Station Surrey KENDRA Townhomes your new home. 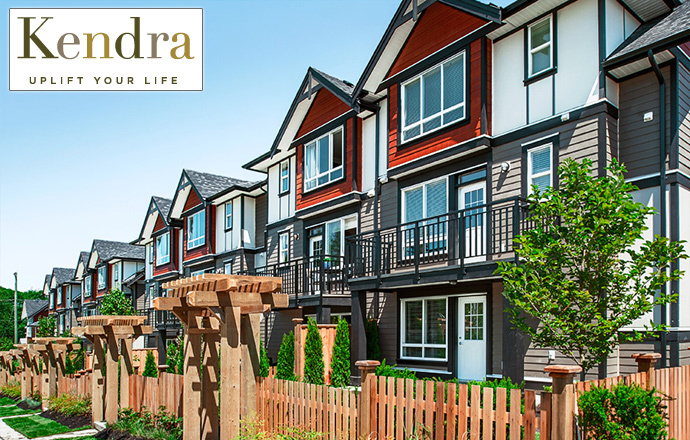 Coming soon to the fabulous Surrey Sullivan Station neighbourhood, the Kendra Townhomes for sale features only 38 elegantly designed town houses that are family/children friendly, open concept, functional and affordable. The three bedroom floor plans are ideal for families and the new Surrey Kendra Townhomes at Sullivan Station neighbourhood will come with side by side garages and flex rooms for some of the homes. Also, there are open patios and balconies for great outdoor entertainment and relaxation space. Best of all is the starting price point of these pre-construction Surrey Kendra Townhomes which starts from just the mid $300,000’s. The spacious 3 bedroom plans start from about 1,500 square feet as well which is a good size to grow into for growing families. The Sullivan Station Surrey real estate location is very close to recreational opportunities, schools and shopping. More information is coming online at www.liveatkendra.com and the anticipated preview opening is for Spring 2013. The project is brought to you by Hayer Properties. 38 elegantly designed family townhomes coming soon to Surrey’s Sullivan Station neighbourhood. These hand-crafted 3 bedroom townhomes will feature breezy, light filled interiors with a myriad of useful designer touches. Enjoy spectacular living of over 1,500 sq.ft. plus flex space, open decks and/or patios and double garages. These homes definitely have the single-family feel you are looking for to take you to the next level! A boutique collection of handcrafted 3 bedroom homes featuring exquisitely detailed, light filled interiors with useful designer touches are waiting for you at Kendra Surrey townhomes. This is what you’ve been waiting for! 38 elegantly designed family townhouses in Surrey. Enjoy over 1,500 square feet of spectacular living space that has that single family home feeling you’ve been waiting for. Set in the ultra desirable neighbourhood of Surrey Sullivan Station, Kendra Townhomes for sale is ready to take you to the next level. Display home is opening soon! Staring from the mid $300’s.